Julie is worried about a shifty-looking guy at the bank. Des calls the police. Maria tell her sister Anna that she's worried about Danny and Max's relationship. Danny is home, and Shane is on his way. Danny's still depressed about the accident. Anna tells him he has to stop blaming himself for the accident. Jim comes round and asks Anna for a word - he's got a problem - he wants to ask a beautiful woman out to dinner. Anna enthusiastically agrees. Daphne comes round to see Shane and says Des has offered Shane and Danny the use of his car for his trip. Just then, Shane has a spasm in his back, but it turns out he's just having a joke. Maria is very annoyed. Daphne tells him off for scaring them as well. Danny also is angry. Shane apologises and Danny calls him a ratbag. Maria asks Daphne to join them for a welcome home gathering for Shane. She doesn't really want to because of the way Max feels about her, but eventually agrees. When Daphne is gone, Max has a thunderous look on his face - he doesn't like Daphne hanging around. 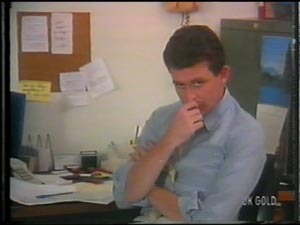 The shifty-looking guy is back. A plain-clothed policeman is in the bank as Julie serves behind the counter. Just then, the shifty-looking guy comes to the counter and opens a briefcase. He gives Julie a note. She panics without reading it and presses the alarm. The plain-clothed police immediately arrest the guy. 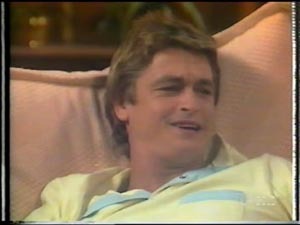 When Peter has gone, the police tell Julie they know Peter Kirk's father - he's one of the wealthiest people in the neighbourhood. 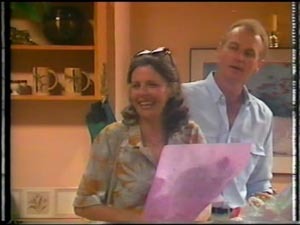 Jim and Anna are out and he buys her a nice bunch of flowers (the old smoothie!) Jim invites Anna to come to the market with him on Sunday. Peter Kirk has come round with a balloon and flowers for Julie as an apology. She isn't pleased that he has followed her home. Julie is still a bit indignant, but Peter says he knows it will take at least six more visits before Julie forgives him(!) She reluctantly accepts the gifts. PETER: See you soon, Miss Robinson. Jim and Anna come in carrying a load of shopping. Julie comes in and sees them together. She isn't very pleased. She puts down the stew she's brought for Maria and stalks off. Jim and Anna are laughing together. Danny is hoping Anna will still be there when they get back from camping. 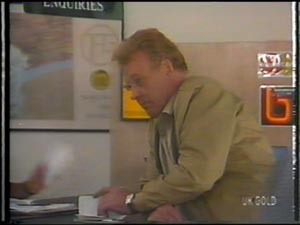 Just then, Peter Kirk arrives, much to the surprise of Des and Julie. 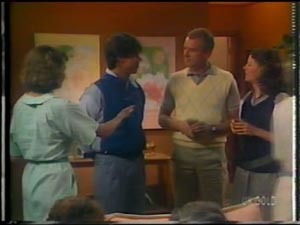 Des gets him a beer while Julie introduces him to Jim and Anna. Max is looking very fed up. Shane suggests that he takes Maria on a bit of a holiday, but he doesn't want to. Danny is dancing along to 80s music as he and Shane head off on their trip. Shane and Danny have put up their tent and are trying to put together a meal for themselves. They chat about the Olympics. Shane thinks he could have done it, but there's nothing to be done about it now. They chat about Daphne too - Danny wants to know if Shane still likes her, but Shane doesn't want to talk about it. He takes offence and walks off. Daphne tells Des that she feels a bit sorry for Julie - she thinks she's a very unhappy person underneath. Shane and Danny are fishing, but not catching anything. Shane apologises for getting shirty before - he does like Daphne, but he doesn't think it's fair to keep seeing her. He could have a relapse on his back and end up a paraplegic. Shane tells Danny there is something he can do - he wants him to start training as a diver. Also, Max would be able to train him. Danny isn't keen and tell Shane to forget it. Jim is still hanging around Anna. Maria sees Julie driving up with Peter Kirk through the window. Shane asks Danny if he's thought any more about his diving idea. Shane thinks that Danny could do it. Danny seems quite keen on it - he's more disciplined that he was a few years ago now. Danny says he'll think about it, but only if Shane will come along to training as well as Max.